Fuji has expressed delight at the reception of its premium compact, the Fujifilm X100, which it says has sold twice as many as predicted. Launched in 2010, the camera was a huge success in 2011 and for many marked Fuji's re-entry into the serious photography market after dropping out of SLR production back in 2006. Speaking to TechRadar, Adrian Clarke, senior vice president for Fujifilm Imaging said, "We've sold about twice as many as we expected. "It was quite unusual, most people thought we were mad when we launched a fixed lens camera at that price." The Fuji X100 features a fixed focal length lens and an APS-C sized sensor, and retailed for around £900 when it was first released - it now sells for around £700. 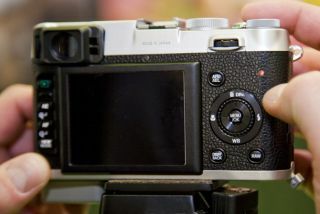 Since the launch of that camera, the company has also released the Fuji X10, which houses a smaller sensor and a zoom lens. In February, it unveiled the Fuji X Pro1, the company's first compact system camera with an APS-C size sensor. This sensor has proven to outshine those found in some full-frame DSLRs. Clarke says that Fuji X100 sales are still strong: "There will be some cannibalisation of the X100, maybe people will look to buy an interchangeable system with standard lens, rather than just a fixed lens - although they are different focal lengths," he said.